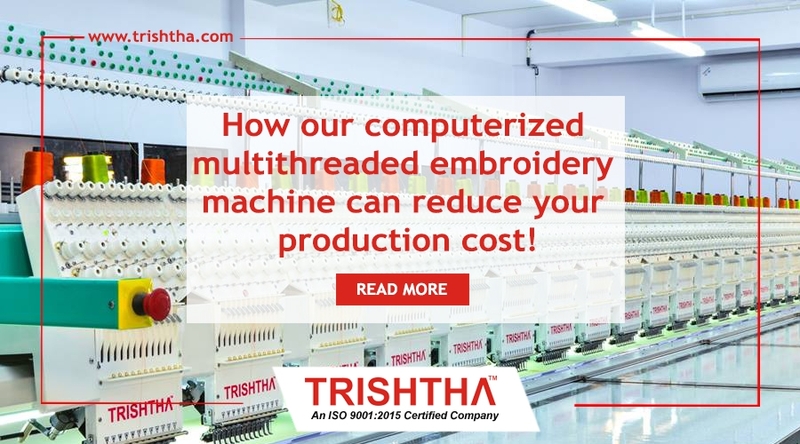 How Our Computerized Multithreaded Embroidery Machine Can Reduce Your Production Cost - Trishtha Industries Pvt. Ltd.
How our computerized multithreaded embroidery machine can reduce your production cost! Trishtha’s advanced computerized embroidery machines offer a broad range of designs and the kind of accuracy that you desire. Our machines come with a hoop or frame system, and are specifically engineered to enhance the efficacy of production. You can make use of our machines for advertising or craft projects, branding and industrial stitching. With the addition of our computerized embroidery machine to your equipment arsenal, you can significantly boost and systematize your production. Keep reading to know how you can bring down the cost of production with our machines. As a leading embroidery machine manufacturer, we are dedicated to manufacturing and supplying latest embroidery machines with advanced technology and features. Since our machines are computerized, they go a long way in reducing the need for manual labor. So, whether you are a home-based embroidery business owner or own a factory, installing our machines will help you in cutting down your workforce. Our machines do not need human interference, just someone to load the designs. This means that you can run a successful embroidery business with half of your current workforce or even less, thus, saving your overall production cost. Are you thinking of expanding your business without having to undertake a huge investment? Turn to us, the premier embroidery machine supplier. Our multithreaded embroidery machine is what you need to increase your production without exorbitant capital outlay. Since these machines are capable of operating with four threads or more, you can expect a design to be completed quickly and with precision. So, you don’t have to worry about changing the thread when the embroidery work requires it, but finish it in one go. As our machines save you precious time and increases production, you get to decrease your costs and improve your revenue. Do you still have any confusion? Feel free to get in touch with Trishtha. We are a renowned and respected embroidery machine supplier based out of Kolkata and will be glad to help you choose the most appropriate machine for your use.